Cut oranges crosswise in half. Squeeze to remove juice; reserve for another use. Place shells, cut sides up, in muffin pan cups. Add 2/3 cup boiling water to each flavour jelly powder; stir 2 min. until completely dissolved. Spoon into orange shells. Refrigerate until firm. Cut each shell into 3 slices. Use the orange juice to prepare your favourite fruit smoothie. 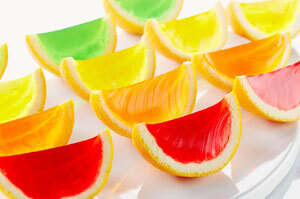 Prepare using any flavour Jell-O Light Jelly Powder.